Disclaimer: This topic was made with the greatest care and a lot of effort was done to make it as accurate as possible. The article should be used for informational purposes only. Not in any way is this topic meant to promote the pieces issued by ISIL. Buying 'coins' from ISIL is considered as terrorist financing and so illegal. 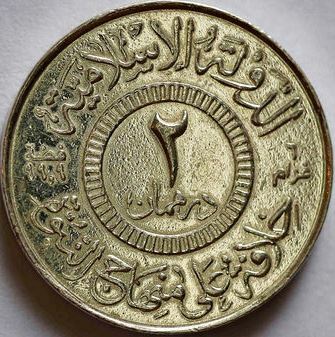 On 7 November 2014 a tweet appeared in which was suggested that ISIL was going to introduce its own coins. Apparently in the beginning only leaders were allowed to use the coins. 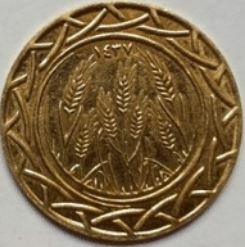 In the days after this first report the news got more and more attention as several religious leaders from Iraq announced the news in their prayers and asked the people to start using silver and gold as a form of payment. It became clear that ISIL's coins were going to be made out of gold and silver. One week later the first images were published following a statement by ISIL. 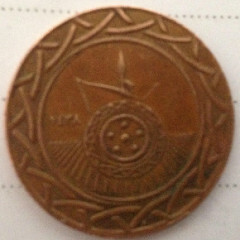 On the radio, people tried to convince the listeners to start using the new coins. Furthermore flyers were handed out to the public and banners appeared on the streets. 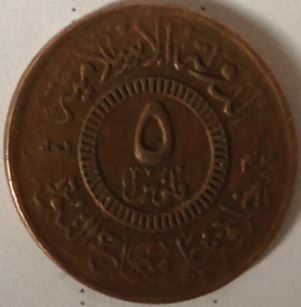 It became clear that 2 copper coins, that had not been mentioned before, were also part of ISIL's coin series. 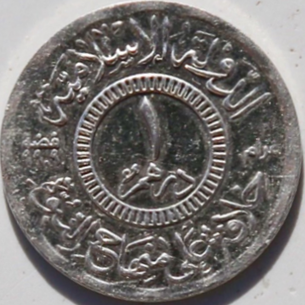 The pieces were a kind of re-introduction of the silver dirham and gold dinar, an ancient Islamic currency. 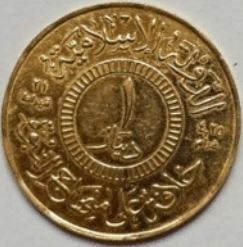 The dirham and dinar are these days still being used as circulating coins in several middle-eastern countries but are no longer made out of precious metals. They wanted to introduce these coins to improve their economy. 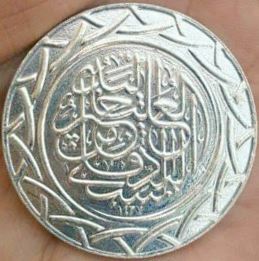 The idea to reintroduce the silver dirham and gold dinar is not new, in 2010 Muslims in Kelantan in Malaysia also tried to re-introduce that currency. Furthermore an attempt was done in Afghanistan. Both attempts were unsuccessful in the long term. ISIL also finds that their gold currency is better than paper money that is being used by other countries. According to experts things like having an own currency, flag etc. should be seen as ways to define one’s territory rather than a serious attempt to separate from the global economy. 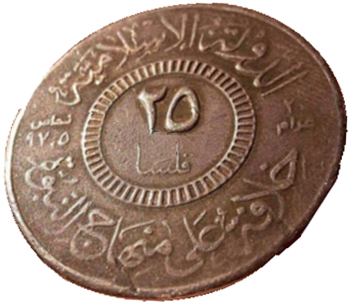 ISIL considers itself as a worldwide caliphate, something that is represented on the 5 Dinar piece. It is unknown to what extent these pieces are being used for transactions. There is at least 1 bank in Mosul that accepts them. On 27 September 2015 ISIL banned the use of Syrian banknotes of 500 and 1000 pounds. Some say this was done to increase the use of the new coins. 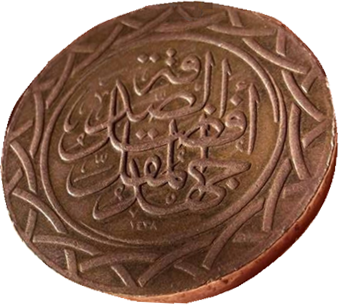 Specifications of the coins as announced by ISIL, unknown if all of these have also been minted by them. *Only the gold coins have an indication of the fineness of the metal. **Sentence refers to a prophecy attributed to Prophet Muhammad, who explains how religious authority will become increasingly secular and abusive after his death until the caliphate is restored. : A photo that appeared online on April 30, 2015. On 7 October 2015, Turkish police raided a mint in Şahinbey, a city in the south-east of Turkey near the Syrian border (marked red on the map). 56 dies were seized. With these dies it was only possible to mint 1 and 5 dinar coins. 6 people were arrested, some of which were foreigners of an unspecified nationality. 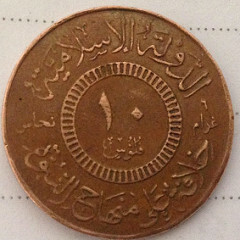 The designs on the seized dies match with the designs on the 1 and 5 dinar coins shown in ISIL footage. The fact that no dies were found of the other denominations leads me to believe that the 10 Fulus-10 Dirhams coins were never minted by ISIL. 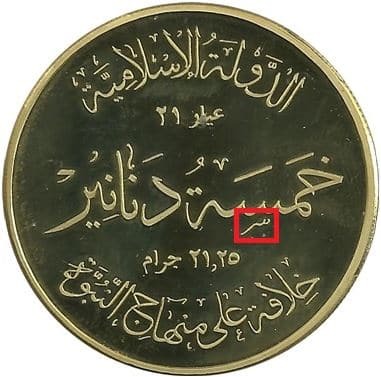 In its footage ISIL only showed minted pieces of 1 and 5 Dinar and computer drawings of the other denominations. 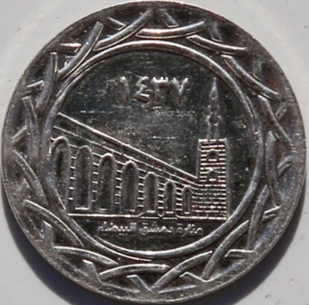 Furthermore as can be seen in the images below there is a difference in the lettering between the 5 Dirham pieces that were minted at the mint in Şahinbey and the pieces that are being offered for sale by dealers. Both things lead me to believe that there are being sold many fantasy imitations that don't originate from ISIL at all. Left photo: Piece similar to the ones of which the production can be seen in a propaganda video of ISIL. 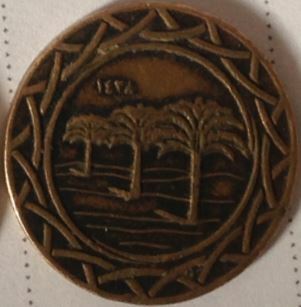 It matches with the design on the dies that were seized at the mint in Şahinbey. Right photo: Chinese imitation based on the computer drawings released by ISIL (?). On July 3, 2016 images of a new series of gold ISIL coins appeared online. On October 13, 2016 images of silver ISIL coins started to appear which are part of this same series. The introduction of the pieces was announced by the terrorist organisation in May, 2017. The pieces are dated 2016 (١٤٣۷). 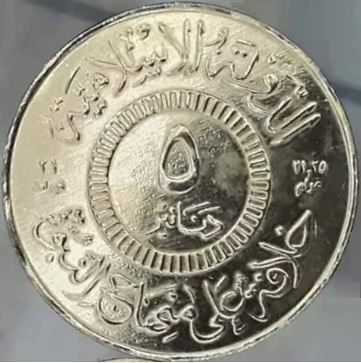 One week after the first images of the new coins appeared online, multiple sources reported to an Iranian press agency that ISIL started minting coins in Deir ez-Zor. It is unknown if this new series has been minted there but it is known that pieces were found in circulation there. 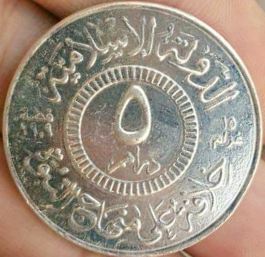 According to these same sources ISIL forced local businessmen to use its coins as currency. Some local currency exchange offices have the Islamic State Dinar in stock. In April of 2017 ISIL put further pressure on citizens of Raqqa to only use the Islamic State Dinar. Citizens must exchange their Syrian liras into Islamic state dinars at an exchange rate of 1000 liras is 1 Dinar. 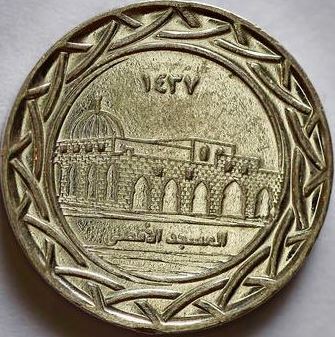 However if they try to pay with the 1 Dinar piece, they can only buy goods worth 900 Syrian liras. People do not trust the new currency which is also why they do not want to exchange it. 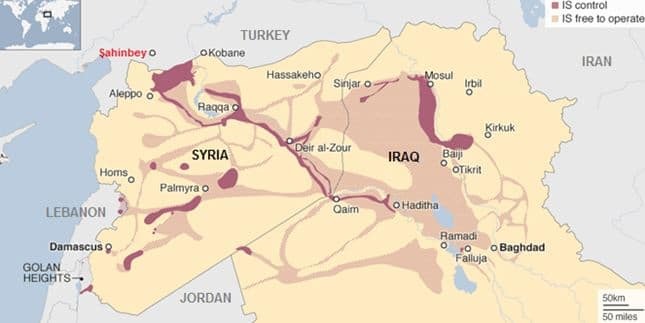 One of the reasons for the distrust is the fact that it is nowhere being accepted outside of Raqqa. 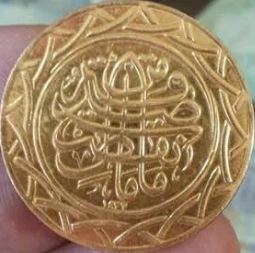 The gold pieces are rare as most Syrian people can not afford them. 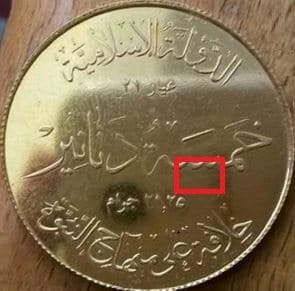 Allegedly ISIL fighters are being paid wages with these new coins and poor people are being paid zakat with them.